When paying via PayPal through the MPCsounds' Online Store, your transaction in your PayPal Account will always show as payment sent to "MODERNBEATS INC ". Plus, under "Details" it will show support [a|t] modernbeats [d|o|t] com as the official PayPal email. When using your credit card via MPCsounds' Online Store, rest assured that the transaction is secure. We use advanced encryption technology that safeguards your personal information and guarantees privacy and security. Your transaction on your Credit Card Statement will show as a charge from "MODERNBEATS INC" (ALL CAPS). If your statement does not read exactly as above, email your questions and concerns directly to support [a|t] mpcsounds [d|o|t] com for help. NOTE: MPCsounds does NOT accept phone orders nor process orders over the phone. MPCsounds.com's phone line is reserved solely for customer support. All Credit Card & Paypal orders must be placed online directly through MPCsounds' Online Store located at www.mpcsounds.com. Email your questions and concerns directly to support [a|t] mpcsounds [d|o|t] com for help. Email questions regarding money orders to support [a|t] mpcsounds [d|o|t] com. If you 're unable to order via our Online Store or by Money Order, you may order by sending a wire payment via Western Union ($75 minimum order required). Before sending a Western Union payment, you must email support [a|t] mpcsounds [d|o|t] com to request wire details. Never wire funds to MPCsounds without first emailing support [a|t] mpcsounds [d|o|t] com. Express Mail (1-2 days from shipping date, guaranteed) shipping inquiries must be called in before noon MON-THUR. Please Note: Shipping prices vary depending on the amount of products selected but start at the amounts above. Global Priority (6-10 business days) $14.95 Please Note: Shipping price will vary depending on the amount of products selected but start at the amounts above. Delivery times for destinations outside of the United States are approximate and cannot be guaranteed, therefore, please allow 10 full business days (not including weekends) for delivery. Additional import duties, fees, and/or taxes may apply to international shipments. All Soundware, Software, and Literary products are non-refundable once passwords have been issued or product is shipped. To avoid unexpected problems and hassles, be certain to read full product descriptions before placing orders. All shipped disks come with a 30-day replacement offer where you are allowed to return defective disks in for replacement disks. Need to Upgrade Formats? Upgrade Today! MPCsounds set = 75% OFF regular price. 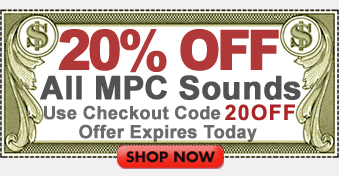 MPCsounds set = 60% OFF regular price. ModernBeats set = 75% OFF regular price. ModernBeats set = 65% OFF regular price. VIP Archive round for more free samples & loops! Please Note: Business hours are 9:30 to 5:30 Central Standard Time, Monday-Friday.